A quaint and laid-back beach town only 30 minutes from Hamilton, Raglan is a popular destination for holidaymakers. With fishing, surfing and a large harbour surrounded by several beaches spread along kilometres of coastline of black sand, our Raglan accommodation provides the perfect spot when staying in the area. 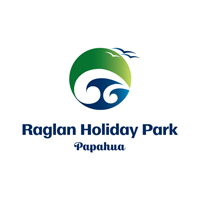 Raglan Holiday Park is a popular destination from which to enjoy all Raglan has to offer. Reflecting its inhabitants who opt for a more relaxed lifestyle on a permanent basis, Raglan boasts a welcoming holiday feel with the Raglan township packed full of interesting shops, cafés and restaurants. Many resident artists and musicians fill our colourful community. Raglan is a world-class surfing destination. Sought out by many of the world’s best, the near perfect left-hand break at Raglan’s Manu Bay is a true surfer’s Mecca. Also known as The Point, this famous Raglan surfing attraction is, in the right conditions, said to have the longest left hand ride in the world. Click here to view your Raglan accommodation options at our holiday park.